An Australian Square Kilometre Array Pathfinder (ASKAP) telescope dish at Murchison Radio-astronomy Observatory (MRO) in Western Australia. ASKAP opened today and, according to CSIRO, will generate more information than is contained in the US Library of Congress on its first full day of operation. The Australian Square Kilometre Array Pathfinder (ASKAP) radio telescope which opened today at the Murchison Radio-astronomy Observatory (MRO) in WA will be utilising an NBN connection to transfer data at 40 gigabits per second--the equivalent of streaming 2,000 Blu-Ray movies simultaneously down a single pipe. The Blu-Ray comparison was made by CSIRO Square Kilometre Array (SKA) Australia and New Zealand director Doctor Brian Boyle during a press briefing this week. He said that without the NBN hook-up with Geraldton and Perth the scientific data generated by ASKAP would not be accessible by researchers in Australia and beyond. “Although we have a world class supercomputer at Murchison which will bring together the data from ASKAP, we have to get the data out to the rest of the world for researchers to use,” Boyle said. The ASKAP is made up of 36 radio telescope antenna which will `listen’ to radio waves from the cosmos. According to Boyle, radio waves tell researchers unique things about the cosmos such as the gas from which stars are formed and exotic objects such as pulsars which will “push the boundaries” of researcher’s knowledge of the physical laws in the universe. “Radio astronomy also gives us insight into the very beginnings of the universe and ASKAP was always designed to make a fundamental contribution to astronomy,” he said. All the data researchers receive from the CSIRO radio camera and 36 telescopes will be combined together using high performance computing (HPC) power, not only at the Pawsey Centre in Perth but also on site at MRO. A $33 million Cray supercomputer will be built at the Pawsey Centre over the next two years to support ASKAP. In 2013, the Cray supercomputer will have a combined performance of 0.3 petaflops, with this to increase to 1.2 petaflops in 2014 using Intel Ivy Bridge, Haswell and MIC processors. Demand to use ASKAP has been so high that the first five years have already been booked out by international researchers. “Over 350 different researchers from 150 institutes around the world have booked to use time on ASKAP,” Boyle said. According to Boyle, the primary goal of ASKAP is to study and eventually take images of all the black holes in the known universe. The starting point for black hole research will be the Centauraus galaxy, over 11 million light years from Earth. Boyle said that the Centaurus galaxy has a black hole in the middle which is 50 million times the mass of the Sun. “We now think that black holes are ubiquitous in the formation of galaxies but we can’t study them very easily because we don’t have the wide fielder view capability,” he said. Current images of the black hole in the Centaurus galaxy available to Australian researchers were formed using the Australian Telescope Compact Array from over 400 images. “It took two years to put together [that image] and 10,000 hours of computer time,” Boyle said. “With ASKAP, because of its wide field of view and the new radio camera, we can do this with two images, five minutes of observing time and five minutes of computer time." 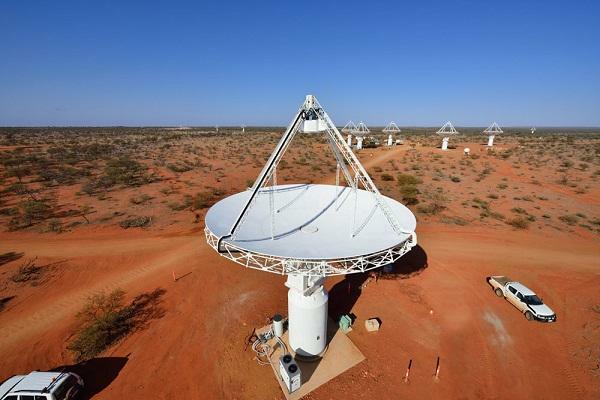 Beyond ASKAP, Australia is also playing host with South Africa to the Square Kilometre Array (SKA) radio telescope. In May 2012, the SKA board announced Australia and South Africa as co-hosts of the telescope. “We [ASKAP] will be operating at the very lowest frequencies in the SKA using antennas that are much smaller than the ASKAP dishes,” he said. According to Boyle, on ASKAP’s first full day of operation it will generate more information than exists in the US Library of Congress. However, the SKA telescope will create even larger data sets with Boyle estimating that the information will be equivalent to about half the total information in all the world’s digital and print photographs. “We are generating huge challenges and we are addressing the exabyte operations per second in computing that the SKA will demand,” he said.